Cinder uses a framework we called ‘API Microversions’ for allowing changes to the API while preserving backward compatibility. The basic idea is that a user has to explicitly ask for their request to be treated with a particular version of the API. So breaking changes can be added to the API without breaking users who don’t specifically ask for it. This is done with an HTTP header OpenStack-API-Version which is a monotonically increasing semantic version number starting from 3.0. If a user makes a request without specifying a version, they will get the _MIN_API_VERSION as defined in cinder/api/openstack/api_version_request.py. This value is currently 3.0 and is expected to remain so for quite a long time. Example: parameter filter_by takes a small set of constants/enums “A”, “B”, “C”. Adding support for new enum “D”. Example: an API previously could return 200, 400, 403, 404 and the change would make the API now also be allowed to return 409. Example: changing the return code of an API from 501 to 400. 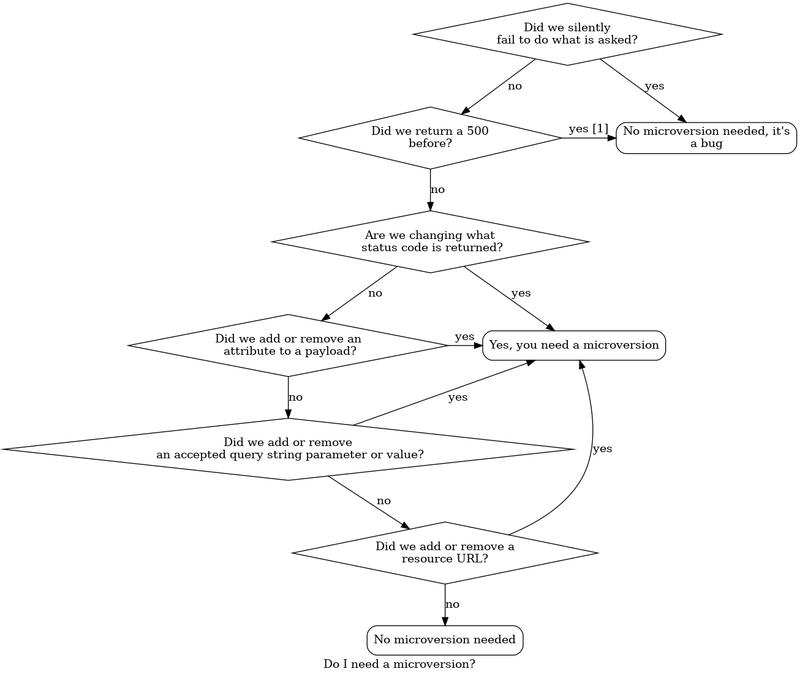 The following flow chart attempts to walk through the process of “do we need a microversion”. If a patch that will require a microversion increment is proposed having similar intention and code with a previously merged patch given the previous merged patch hasn’t been released, then the previously merged patch could be modified to include the new patch code under the same microversion. - When fixing 500 errors that previously caused stack traces, try to map the new error into the existing set of errors that API call could previously return (400 if nothing else is appropriate). Changing the set of allowed status codes from a request is changing the contract, and should be part of a microversion. The reason why we are so strict on contract is that we’d like application writers to be able to know, for sure, what the contract is at every microversion in Cinder. If they do not, they will need to write conditional code in their application to handle ambiguities. When in doubt, consider application authors. If it would work with no client side changes on both Cinder versions, you probably don’t need a microversion. If, on the other hand, there is any ambiguity, a microversion is probably needed. This method would only be available if the caller had specified an OpenStack-API-Version of >= 3.4. If they had specified a lower version (or not specified it and received the default of 3.1) the server would respond with HTTP/404. If a caller specified 3.1, 3.2 or 3.3 (or received the default of 3.1) they would see the result from method_1, 3.4 or later method_2. We could use wsgi.Controller.api_version decorator on the second my_api_method as well, but then we would have to add # noqa to that line to avoid failing flake8’s F811 rule. So the recommended approach is to use the api_version decorator from the first method that is defined, as illustrated by the example above, and then use my_api_method decorator for subsequent api versions of the same method. The two methods may be different in any kind of semantics (schema validation, return values, response codes, etc.). If the minimum version specified is null then there is no restriction on the minimum version, and likewise if the maximum version is null there is no restriction the maximum version. Alternatively an one sided comparison can be used as in the example above. Add a verbose description to cinder/api/openstack/rest_api_version_history.rst. There should be enough information that it could be used by the docs team for release notes. Constants should be used in the code to minimize errors on microversion merge conflicts. Define a constant for the new microversion in the cinder/api/microversions.py file and use that in the rest of the code. Update the expected versions in affected tests. API changes should almost always include a release note announcing the availability of the new API functionality. The description of the API change should indicate which microversion is required for the change, and it should refer to the numerical value of the microversion and not its constant name. Update the version parameter in api-ref responses here cinder/api-ref/ source/v3/samples/versions/version-show-response.json and here cinder/api-ref/source/v3/samples/versions/versions-response.json to the latest microversion to avoid functional test failure. If you are adding a patch which adds a new microversion, it is necessary to allocate the next microversion number. Except under extremely unusual circumstances and this would have been mentioned in the blueprint for the change, the minor number of _MAX_API_VERSION will be incremented. This will also be the new microversion number for the API change. It is possible that multiple microversion patches would be proposed in parallel and the microversions would conflict between patches. This will cause a merge conflict. We don’t reserve a microversion for each patch in advance as we don’t know the final merge order. Developers may need over time to rebase their patch calculating a new version number as above based on the updated value of _MAX_API_VERSION. Unit tests for microversions should be put in cinder/tests/unit/api/v3/ . Since all existing functionality is tested in cinder/tests/unit/api/v2, these unit tests are not replicated in …/v3, and only new functionality needs to be place in the …/v3/directory. Details for each existing microversion change can be found in the REST API Version History documentation.